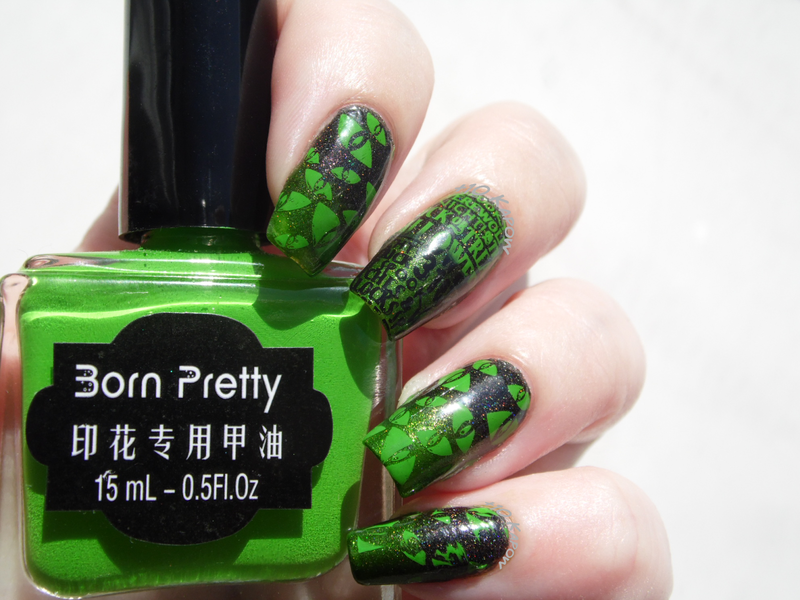 Born Pretty Store released their own range of stamping polishes a little while ago and this is the first one I have tried. This is the bright green one and it's a lovely lime green shade and I thought at this time of the year, it is the perfect shade for some Halloween nail art. 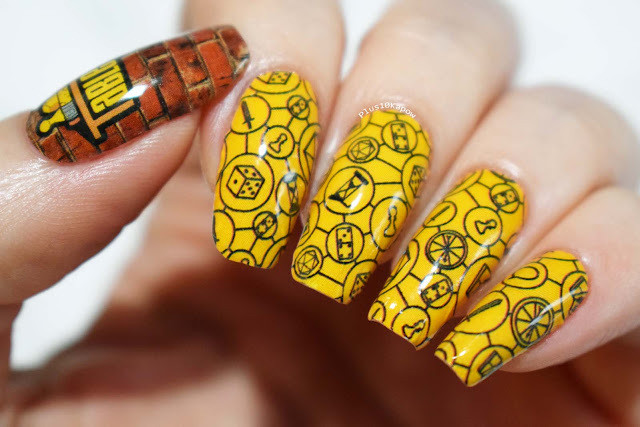 I haven't tried many stamping polish brands before but I think we all know exactly what we are looking for in a good stamp polish. It needs to be opaque, bold and and it needs to work over both light colours and dark. Oh and it needs to not smear when you put the top coat on. This polish is quite smelly and it dries really quickly once on the stamper so I did have a problem being quick enough with both positioning and stamping and I had a few tries before I managed to get it right. Once stamped though, the colour is definitely bold and opaque over both colours that I used for the base and as you can see, the stamping polish had the same colour consistency over both. It is a bit stainy because it is so opaque, and it meant that I got a yellowish stain on my skin and nail, but only a tiny bit. There are a few little patches in the stamp but that is more down to my stamp ability than the polish. Then when I applied the Seche, there was no streakage, apart from the pinkie but we'll ignore that because that was me catching my pinkie on my trousers straight after applying the topcoat, but now that I have mentioned it, it probably turns out that you didn't notice and there was no reason for me to mention it. Yep, I thought so. Polishes used for the base gradient are PolishedByLeanne Tavern on the Green and Lurking Nightcrawler. 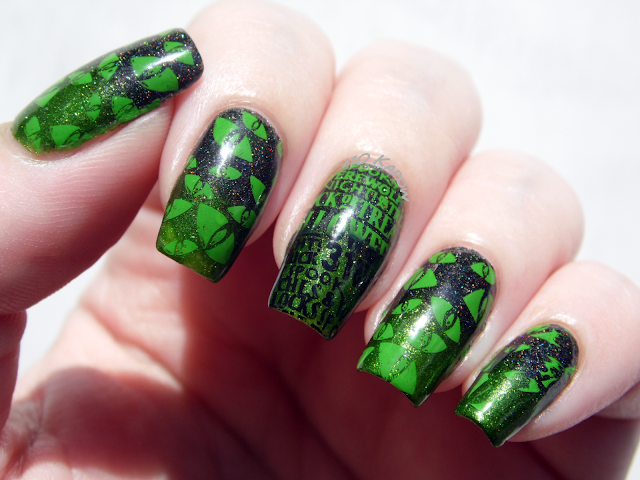 Stamping plates used are Bundle Monster H07 and H08. If you follow me on Instagram you can pop over there to see the base for this mani in all its sparkly glory. Anyways, this is a good stamping polish and I expect the rest of the range is just as good. 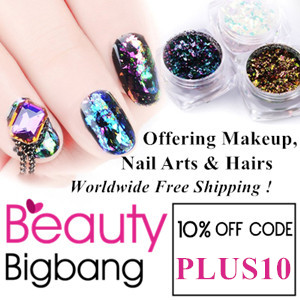 You can get this polish here for £2.34/$3.59 and you can see the rest of the range here. 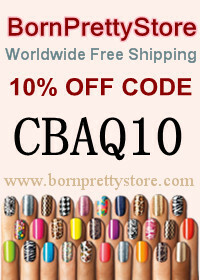 Use my code CBAQ10 to get 10% off your basket amount. 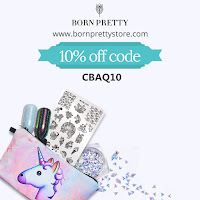 Born Pretty Store are also celebrating their 5th anniversary, so a massive congratulations to them and a heads up to you guys, to celebrate they are doing some 1p (£0.01) sales, there are some good items in there so worth snapping up while they are a penny. You can find that sale here.